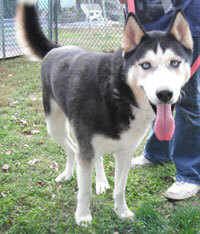 Kita is a handsome three-year-old Siberian Husky who just loves to give kisses. He is good with other dogs his size and absolutely loves people. He is crate trained and knows his basic commands. Sadly Kita’s human mom is ill and can no longer care for Kita and has asked us to make sure this sweet guy finds a wonderful forever home. Of course, we promised her we would take care of Kita and make sure he finds a new family to love and spoil him. Kita is a smart boy and anxious to please. He needs someone that is dog-savvy and will be devoted to him and continue with his training. If you are looking for a new best friend, please ask us about this great pup.